Significantly lighter than cowhide, Kangaroo leather sets the Dainese Trickster Race Suit apart from the rest of the pack. It packs in all the high-end Dainese features as well, which makes it a great option for the serious racer. Arriving right at the $1999 price point, the Dainese Trickster Kangaroo certainly has something up its sleeve. If you're new to Kangaroo leather, let me break it down: studies have proven that kangaroo is one of the strongest leathers on the market- bottom line, it has higher abrasion resistance than cowhide. It's supple, allowing for great mobility on the track, and incredibly lightweight- you will never feel weighed down when racing. I really can't say enough about its superior quality when compared to cowhide. 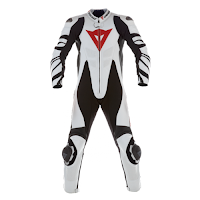 Beyond the kangaroo chassis, this suit is fully charged with other classic Dainese features. You have your bi-axial elasticated & S1 stretch panels for comfort, mobility and airflow. CE Rated internal protectors in the shoulders and the knees, topped with Dainese's upgraded titanium shoulder insert and replaceable knee sliders. It has Dainese's proprietary NanoFeel removable & washable liner. The liner is given a silver ion treatment, the newest technology for maximum sanitization and antibacterial properties for garments. The leather is perforated throughout the suit with additional perforated Temperfoam panels for added safety. Stylistically, the addition of suede split inserts in the arms gives the Trickster a very unique look. Lastly, I want to hit one of my favorite auxiliary features of this suit. The aerodynamic speed hump has a built in pocket for a water bag, so for those really intense track days or races, you can feed the provided hose from the pack under your helmet to stay hydrated. This racing suit is in the upper echelon of not just Dainese, but any suit that's out there on the market. It's packed with features that the regular track guy or racer is sure to appreciate. 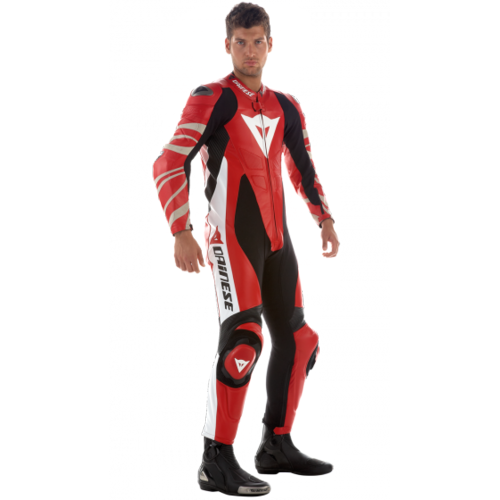 To compare and contrast, visit our section of motorcycle race suits. 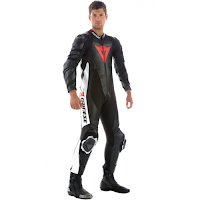 To see Dainese's full lineup of suits, visit the Dainese Race Suit section of our site.